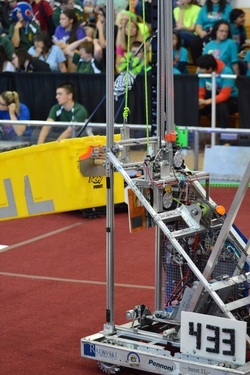 The Firebirds joined FIRST Robotics in 2000 under the name M.I.N.T.- Mounties Interested in New Technology. After a mishap in which our robot caught fire during one of our first matches, our team rose from the ashes and renamed ourselves the Firebirds. During our 2018-2019 season, we are celebrating our team's 20th anniversary and every single girl who has gone through our program. The Firebirds are based out of Mount Saint Joseph Academy, an all girls school in Flourtown, PA. Team 433 was the second all girls FIRST Robotics team and is the longest running FIRST all girls team in the world. Our team vision is to develop confident, compassionate, and courageous young women who can and will achieve their dreams and improve the world. As an active part of the FIRST Robotics community, the Firebirds take the mission of FIRST Robotics to heart. to create a world in which everyone, regardless of gender, ethnicity, or income has access to experiences that celebrate and encourage STEM so that the dreams of today become the realities of tomorrow. Being a part of the Firebirds prepares members for college and professional careers within the fields of STEM- Science, Technology, Engineering and Math. Our mentors play a large role in our education and interest in the areas of STEM. They show us the importance of achieving academic success and the value of STEM professions through their everyday involvement on the team. As members of team 433, we try to promote self-confidence and team spirit. With this team spirit, the members of the Firebirds form a close bond that enables every girl to feel empowered. In order ensure that everyone on the team feels comfortable, we hold sessions at the beginning of the school year to teach new members how to build and program robots. We feel that introducing new members to new tools and techniques from the beginning of their time on the team creates enthusiasm and eagerness to become involved during build season. Our team has a businesslike structure that is led by the President and Executive Vice President. These teams include technical operations, social affairs, human resources, digital operations, finance, and outreach. Each sub-team works throughout the year to make the Firebirds the best team we can be both on and off the competition floor. All members, regardless of what sub-team they are a part of, participate in the building, programming, and/or driving of the robot during build season and competition.